Wolf Ridge is an IGT based online slot that is playable across all devices including mobile phones. This slot comes in with 5 Reels and 30 Paylines and has total 50 coins. Coin sizes for the game starts from 50p per spin to £€1,000 per spin. The game has 2 Bonus rounds/features and it gives you an option to receive a huge up to 250 free spins. 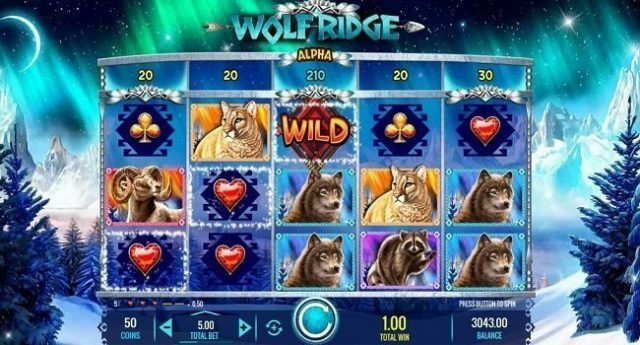 As the name suggests, the Wolf Ridge slot is based on wolves where you will see 5 bright coloured gemstones symbols as well as racoons, mouflons, lynxes and wolves. The wolves is the most rewarding symbol of this game as it pays you 10 times of your stake if you land 5 of these symbols across your payline. The game also includes a wild symbol that could replace all other symbols on your reels except the Wolf Scatter but it only appears on middle 3 reels i.e. on reel 2, 3 and 4. The game has 2 Bonus features. The first one is the Prize Disk feature which would get you cash prizes or will offer you to enter to the Free Spin Bonus Feature. During the Free Spin Bonus Feature you could get up to 250 free spins while during Prize Disk prizes you could receive 3x and 2x prize multipliers. Wolf Ridge is an awesome slot game developed by IGT Gaming. The Wolf itself is the scatter symbol and can appear on reel 1, 3 or 5 and would trigger Prize Disk feature. You will receive 2 to 70 times of your total stake if you are landing Wolf symbols on your reels. This Wolf Scatter will give you up to 210 times of your stake if you land the symbol on appears in any position on reel 3. This game of Wolf Ridge slot is all about the Prize Disk feature which offers you great cash prizes during base game and free spin feature. You can win a maximum of 1,000 times of your stake while playing or checking out this game for real money. Play Wolf Ridge video slot at any IGT Casino Online.